Make your garden a more magical place. This exquisite Sunjoy Butterfly LED Solar Garden Stake not only adds a fanciful touch to your patio, garden or path, it provides eco-friendly outdoor lighting. Gathering energy from the sun during the day, the LED light comes on at night to illuminate your path. The butterfly garden stake features a delicate painted glass butterfly upon a long green vine, suspended in midflight over a spherical crackle ball. A tiny ladybug crawls up the vine, which is adorned with blue and gold flowers that rise up from just above the folding solar panel. This stake measures just over 42 inches tall, and is made of sturdy iron. The solar panel requires no set up. Simply place in a location that receives sunlight and enjoy the benefits. Gathering energy from the sun during the day, the LED light comes on at night to illuminate your path. he butterfly garden stake features a delicate painted glass butterfly upon a long green vine, suspended in midflight over a spherical crackle ball. A tiny ladybug crawls up the vine, which is adorned with blue and gold flowers that rise up from just above the folding solar panel. 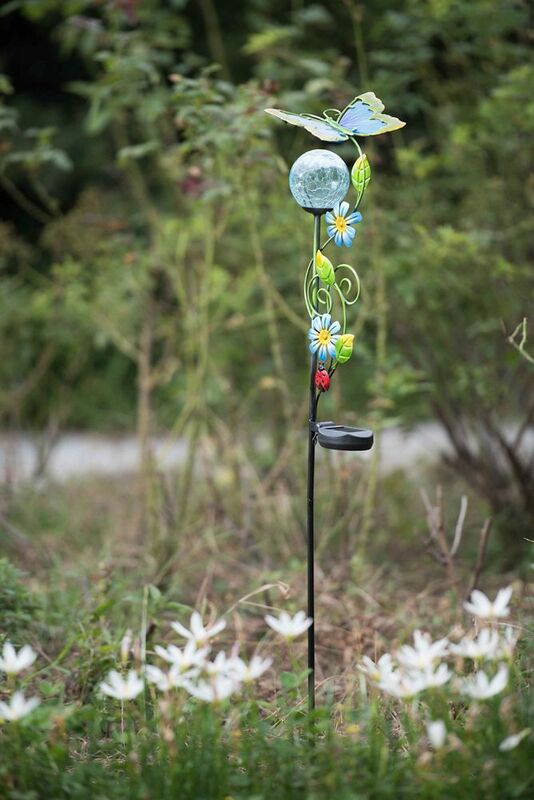 This colourful Sunjoy Glass Bird Feeder Garden Stake serves multiple purposes, providing a touch of beauty and art to your garden or patio and also drawing small birds and butterflies to your yard for a snack or a bath. The stake features two lovely iridescent glass plates. The bottom tray, painted in a glorious pink, functions as either a bird feeder or bath and the top, painted in teal and yellow, is an additional feeder. Simply add jelly, a nectar-soaked sponge or pieces of overripe fruit and enjoy the songbirds that come to visit. This ornate stake is adorned with amber, pink, blue and green glass orbs affixed to the sturdy iron rod, giving this delicate piece of art a whimsical appeal. By flushing the tray with water, the bird feeder is incredibly easy to clean. Do not put in a dishwasher. The bird feeder garden stake itself features a three-prong base for easy placement in the ground. 43 Inch Glass And Metal Butterfly Garden Stake With Solar LED Make your garden a more magical place. This exquisite Sunjoy Butterfly LED Solar Garden Stake not only adds a fanciful touch to your patio, garden or path, it provides eco-friendly outdoor lighting. Gathering energy from the sun during the day, the LED light comes on at night to illuminate your path. The butterfly garden stake features a delicate painted glass butterfly upon a long green vine, suspended in midflight over a spherical crackle ball. A tiny ladybug crawls up the vine, which is adorned with blue and gold flowers that rise up from just above the folding solar panel. This stake measures just over 42 inches tall, and is made of sturdy iron. The solar panel requires no set up. Simply place in a location that receives sunlight and enjoy the benefits. 43 Inch Glass And Metal Butterfly Garden Stake With Solar LED is rated 3.5 out of 5 by 2. Rated 5 out of 5 by Chuck from Works great lights up my bird bath area all nite... Works great lights up my bird bath area all nite Very Nice!